Good Tuesday Morning! I'm really tired today....didn't get much sleep. This is obviously not the project that we're doing today but mine is finished and just needs to be photographed. I had a very busy day yesterday and after everything settled down; it was already past 9 pm.....I finished what I was doing because everyone needs to see a *sample* of what they're making. I hope they really enjoy their appreciation gift from me.....I'm looking forward to some fun in a couple of hours!! 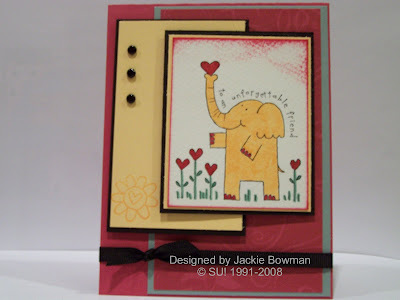 This is another oldie card that I did for a color challenge on SCS. I worked the colors pretty well thanks to the sketch I used. The stampset has to be one of my fave animal sets since I reach for it more than anything else. I colored this cutie with my SU! Markers, added some brads and ribbon---voila....a finished product! I'm really happy you stopped by today and I will post the pic early tomorrow morning! Enjoy the rest of your day!! Cute card. I like the brightness of the brightness of the apricot agains the deep shade of the rose. He he he! I'm the first commenter! Your card is SO cute! I love your color choices too! Great job and TFS! This is very nice - and you've posted early again! Boy, you're good!!! Hope today is by far more restful for you. One thing for sure.... no matter how tired your are, your work is superb! Very pretty, Jackie! Love your little elephant and the colors you used! Nice job! This is tooo sweet, I love this set, and you did a great job with the colors, and the coloring on this!!! Love the layout as well!!! Jackie, I love this stamp too! I used it recently for a Valentine's card. Love your layout! Very cute! So sweet, Jackie!! I really love the layout on this one, am going to save it to my favorites over on SCS! Super cute-I suppose I had better start thinking about making some Valentines!!!! Adorable Jackie! I really like that Colour Combo! Hope your day goes well! Can't wait to see more pics! Very cute card! I've never used this set much, but this one is so cute, I'll have to get it out again. Very cute card, Jackie! I really like the layout and all of the layers!! Super cute Valentine, Jackie!!! I love the colors you used and what a great layout!! Maybe next week I can get started on my Valentines!! Super cute card!! I love that stamp!! Cute elephant! I like this! This is a super cute card! I plan on using this set for some of my Valentine cards this year as well! This is beautiful! And happy! I love your style! Clean and gorgeous!